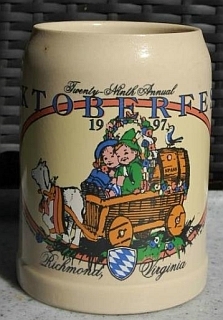 Visitors of the Richmond Oktoberfest have a chance to acquire a beer stein with a new design every year. Themes range from historical events, fairy tales, significant points of interest and buildings, and last but not least “German Gemütlichkeit”. Start your own beer stein collection. At the Oktoberfest visitors have a chance to purchase steins of previous years. Supplies are limited and not all designs are available.